KANSAS CITY, MO--(Marketwired - Mar 21, 2014) - Valerie Jennings, CEO of Jennings Social Media Marketing (JSMM) and Viral Bolt Media (VBM), is the face of KC Business magazine's March issue. She was selected as one of KC Business' most influential women in business in 2014. Jennings started JSMM in 2003 at the age of 24 and has since launched a second company that produces YouTube videos for brands. Jennings was accompanied at the awards event March 19, 2014 by several notable clients, vendors and friends including the president of Frank Ancona Honda, the owner of Laura's Couture Collection, the owner of McCann CPA and other recognizable business leaders. Jennings said that she was honored to receive such a high recognition and be the face of the March cover for the magazine. "What an unbelievable surprise to first be included in the 2014 class with so many amazing women, and then to learn via a tweet from the magazine that you are on the cover of the magazine. I'm just overwhelmed with excitement. Wednesday night (March 19) was an amazing opportunity to network with local leaders in business and learn about so many inspirational women. I'm just so happy to be part of the class and get to know everyone this year. KC Business magazine has done an exceptional job honoring our group and making each and every one of us feel special, appreciated and honored. Thank you!" Jennings was selected as a member of the eighth annual Influential Women program along with 30 other local women in the creative, entrepreneurial and non-profit communities. According to KC Business, "Influential Women are those who inspire others, create opportunities for their organizations, give back to their communities and mentor others." KC Business' feature story on Jennings noted that her career has evolved many times since she started her business more than a decade ago, and her clients include a broad range of industries from travel and tourism to technology, manufacturing and real estate. Read the full profile here. JSMM is a full service company that utilizes the art of online storytelling with the science of measuring quantifiable results. JSMM creates comprehensive social media marketing, mobile, Web videos and website design and development strategies. The company represents publicly traded to medium-sized businesses across the U.S. and overseas including technology, sports, sustainability, entertainment, travel, financial, healthcare and real estate (www.jenningssocialmedia.com). 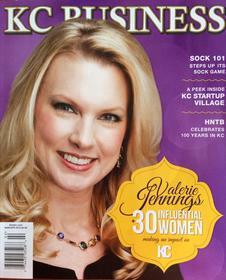 CEO Valerie Jennings makes cover of KC Business magazine March 2014.